For the third time now, we have taken a decisive role in GreenDay Germany, which took place this year on November 15, 2016. On GreenDay, companies, technical colleges and research institutes come together with students from the region and present their environmental and climate protection activities. This year, Nonnenwerth High School 10th graders were granted an exciting look behind the scenes at our Kumpan manufactory. Our product designer Tim took them on a journey through the development of our Kumpan e-scooter. Afterwards, they followed the production process, to see how a Kumpan comes about. To round things off, students could test drive the e-scooter in our manufactory. For many of them, it was their first experience with an electric vehicle and they were thrilled and impressed with how simple, quiet and sporty our Kumpans are. The event was both interesting and informative for everyone involved. With our commitment to young people, we have once more proven how eager they are to learn about our Kumpans, electromobility and environmental protection. It was in September when Peter Carlsson, former Chief Procurement Officer and Head of Supply Chain at Tesla Motors, invited us to the Stockholm Tech Festival. Under the motto Future of Transportation, Patrik discussed future models for the mobility of tomorrow with other e-mobility enterprises. The contact between Peter and Patrik was so congenial, they decided to meet again in the near future. Shortly thereafter, the former Tesla manager and recent member of the inner circle surrounding Elon Musk, visited us in Remagen. He wanted to feel the spirit of Kumpan and everything it stands for, live and in person. In addition to our development department, Peter also closely examined our production, giving us valuable pointers for our Kumpan’s further development, for our organization and for our supply chain. Late that Monday evening, after much strategic brain-storming, we fortified ourselves with an excellent Rhine schnitzel at a restaurant on the Rhine river. The exchange was so pleasurable and fruitful, that we completely forgot the time. Finally, the restaurant owner recaptured his place from the Swedish invaders, ourselves and the four Swedes at a neighboring table. At that late hour, the restaurant was otherwise empty. 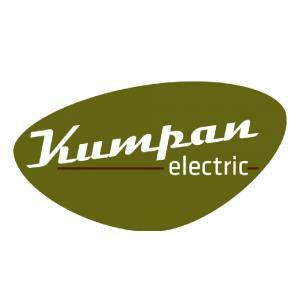 "I visited Kumpan electric yesterday and was very impressed with how they are combining great design, electro-mobility and connectivity to create fantastic products. I believe they have a great future if they continue to evolve like they have been doing so far". We have already enjoyed a highly successful collaboration with the regional Rhine-Mosel Workshops in neighboring Weißenthurm in the past. The Rhine-Mosel Workshops are an integrated facility giving mentally and physically handicapped as well as psychologically unwell fellow humans a place of work, providing a meaningful and appropriate pursuit. Last year, we began the first joint project. The Rhine-Mosel Workshops employees took on the planning and production of our presentation display for the foot bike 1950 model. The collective work on this project was a joy for all of us and the result is nothing to sneeze at. We are currently planning to expand the collaboration with the Workshops, to produce technical construction components regionally. We are engaged in promising negotiations to produce our new cable harnesses for our new 1954Ri model. We consider it our social responsibility to support integrative facilities like the Rhine-Mosel Workshops. In addition to numerous events and activities, we would like your support in cultivating our market position and expanding to other countries. Let us transform the streets of tomorrow together! Invite your friends, acquaintances and business partners to become members of the Kumpan family. Follow us on social network platforms like Facebook, Instagram, YouTube and Twitter. Join the electric revolution!